Take a city, any city, place it on the ocean, give it miles of beautiful sandy beaches on one side, and lush tropical mountains on the other, and you have the potential for a great city. Then place the largest Statue of Christ the world has ever seen on one mountain top and run a cable car to the top of another and people start to take notice. Next make the weather so hot and humid that no one wants to wear anything other than a tiny bathing suit. Insist on all the women being beautiful and mandate breast implants wherever needed. Insist on all the men being handsome, give them great bodies and mandate the wearing of speedos and nothing else (implants of any kind for men don’t seem to be needed). Finally pick one particularly vivacious woman and insist that she wears huge piles of fruit on her head for decades, add a generous splash of danger and you have created what must be the world’s most exciting city. We have arrived in Rio de Janiero for two days. Hong Kong, Sydney, New York, San Francisco are all stunning cities, especially when approached by sea. But none of them gives you the incredible sense of excitement tinged with danger that you get when you first step off the ship in Rio. It is fabulous and the Fabulosity Meter knows it. The temperature is hovering just under 100 degrees (38c), humidity is about 80% and it is a Sunday. The entire city will be at the beach. The only sights worth seeing on a day like this will be posing on the sand. We decide to join them. We have planned to take a bus from where the ship docks, past the City Centre, past Copacabana beach, past Ipanema beach, to the far end of Leblon Beach. Then we will walk back. It’s a walk of something like 5 miles but the scenery promises to be spectacular. Luis, a Brazilian tour specialist onboard ship, visibly blanches when we ask what bus to catch to Leblon. 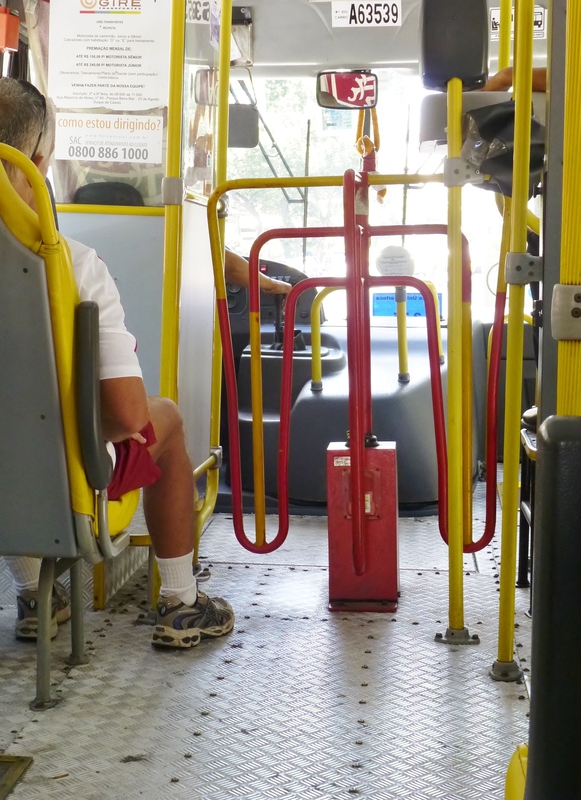 He warns us that a bus ride in Rio is not for the faint of heart. We tell him our hearts are anything but faint, and that we have ridden buses in Buenos Aires and Mexico and that we are well prepared. He smiles knowingly and says that nothing will prepare us for the buses in Rio. He is advising all the passengers to take a taxi. We take the bus. We should have listened to Luis. Being Sunday morning the streets are quiet, which seems to remind the bus driver of the Monaco Grand Prix. This is his chance to show us what he can do and he grabs the opportunity with both hands, a move that is rather dangerous when driving a bus at a little over 60 miles an hour. We have barely got our feet on the first step when the bus rockets forward. We stumble into the bus hanging on to anything that presents itself, which unfortunately in my case was the cord you pull to stop the bus. The driver immediately slams on the brakes and we are thrown back down the steps. Trying not to look as stupid as we feel (quite hard to do at the best of times) we nonchalantly enter the bus for a second time taking our seats quickly before the race begins anew. No bus was ever designed to be driven at these speeds, and when this one was built speeds such as this weren’t even thought possible. If the bus was built with suspension, it had lost it long ago. The metal seats with their threadbare upholstery offer little in the way of comfort. The only available protective padding is what each passenger has been blessed with, and even though I have been blessed with more than some the ride is jarringly uncomfortable. The driver drives with one foot pressed down on the accelerator and the other tapping in time to the music he is playing. One hand is on the steering wheel while the other rams the gear stick around in something of a frenzy. The gear box screams as do some of the passengers. In actual fact most of the passengers fully enter into the spirit of the occasion cheering the driver on to greater speeds. When the bus takes a corner too fast and leans over so far that it is only on two wheels the passengers applaud and whistle their encouragement. The more the passengers show their approval, the faster the bus driver attempts to go. I can feel my bowels loosening but fortunately the jarring action on the metal seats has a counteractive effect and all is well. When we get to the end of the line the passengers disembark, some stopping to shake the drivers hand, others patting him on the back. We make a mental note to tell Luis that he should have tried harder to stop us from riding the bus. This entry was posted in Rio. Bookmark the permalink. Itactually a nice and helpful piece of information. I am satisfied that you just shared this helpful information with us. Please stay us informed like this. Thank you for sharing.